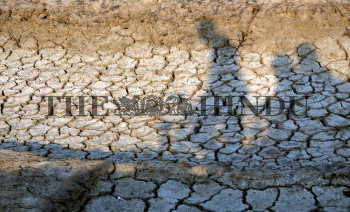 Caption : Kolkata: The agriculture scenario in Sundarbans Islands is reflecting from the dried up farmlands at Sonaga of Gosaba sub-division in West Bengal. Last year, the cyclone ?Aila? devastated entire habitat and seawater flooded almost all the islands located at the delta here. Not only the crop damaged on the field then due to the salination, it also spoiled the fertility of the land for next few seasons. This time, few farmers tried with the regular paddy crop but only harvested straw out of it. According to few farmers, they are not aware of any method to come out of this infertile situation of their land. Photo: Arunangsu Roy Chowdhury Feb 24, 2009.